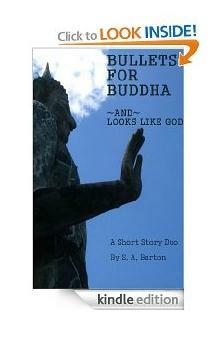 Bullets for Buddha has been on Amazon since February 2012. 75% of the copies that have sold there have been sold in the last 3 weeks. I’m not sure why. Is is just because the word ‘bullet’ and the word ‘Buddha’ really don’t go together, so it makes people look twice? Is it just because sometimes, things happen and nobody really knows why? Sort of like the success of 50 Shades of Grey. Of course, I’m selling nowhere near 1% of what 50 Shades has sold. I must resist the temptation to write 50 Shades of Gautama. I mean, I do like money. On the other hand, I also like to sleep at night. Don’t get me wrong, my goal is to sell my stories; that means my goal is to write things that people will enjoy reading. I don’t think I would enjoy writing 50 Shades of Gautama. The bottom line there isn’t so much ‘artistic integrity’, whatever that means, but that if I’m not enjoying writing, it’s probably going to show in my writing and then you won’t enjoy reading it. I don’t mean to say that I think I need to be in a rapture of joy every second that I’m writing. Sometimes I’m tired and I don’t really want to write, but I know I need to forge ahead and make some progress. Sometimes I’m at an awkward spot where I don’t quite know where to take the story I’m writing, and the feeling of being stalled— or of writing a few hundred words and deciding that they’re not the right words and deleting them— isn’t much fun. I mean I have to like what I’m writing to some degree, or it’s going to be crappy. Just that simple. Maybe those sudden sales are because a couple of people stumbled across it, and they like what they saw. That sounds good to me, and I think it’s a good story. After all, I enjoyed writing it. I wish to report a remarkable coincidence: me, too! LOL Well I am glad you wish yourself the best. Is that the congratulatory equivalent of masturbating? I think so, based on the fact that it feels good, but not nearly as good as wishes involving *two* people.